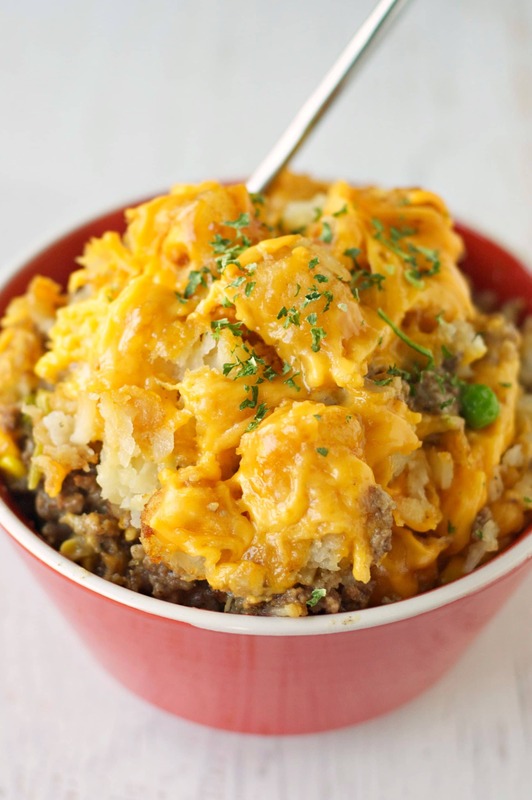 A couple of years ago I was apparently living in a cave and had never even heard of tater tot casserole until a friend told me about it. Sounded pretty simple and soon my family was hooked. I mean, it’s kid friendly (what kid won’t eat tater tots?!) plus even as grown-ups we all kinda still love the stuff even if we don’t really want to admit it. But I guess that’s the other cool thing about it is that you can make it in so many ways that it will appeal to just about anyone’s tastes. And you know me. I can never leave well enough along and I’m now I’m my third version. 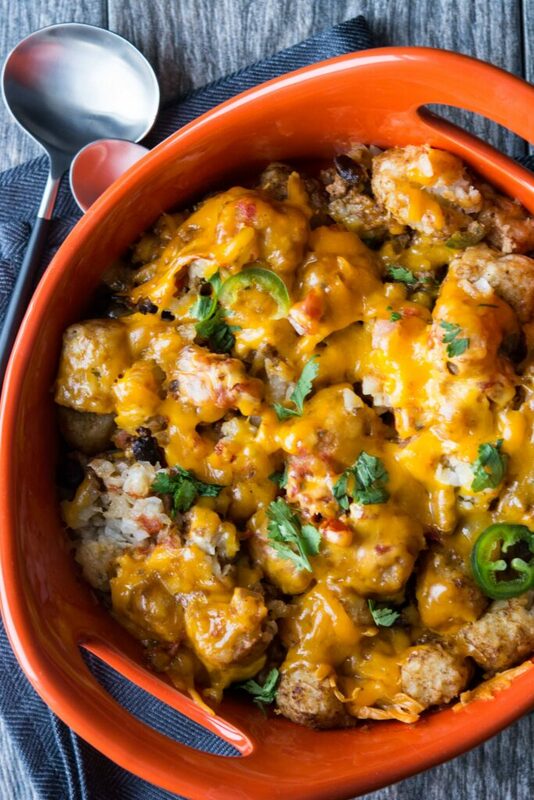 Tater tots for breakfast, anyone? I think we all have them. You know, those go to style recipes that we maybe modify just a little but, really, anytime we are in a pinch to get dinner done we go back to our basic comfort zone. For me, it’s usually what I call “taco stuff”. Sometimes it’s tacos or it could be taco salad or burritos. Either way, it’s the same basic ingredients that I know I can throw together quickly and get people fed. Not glamorous, but sometimes it’s not meant to be. 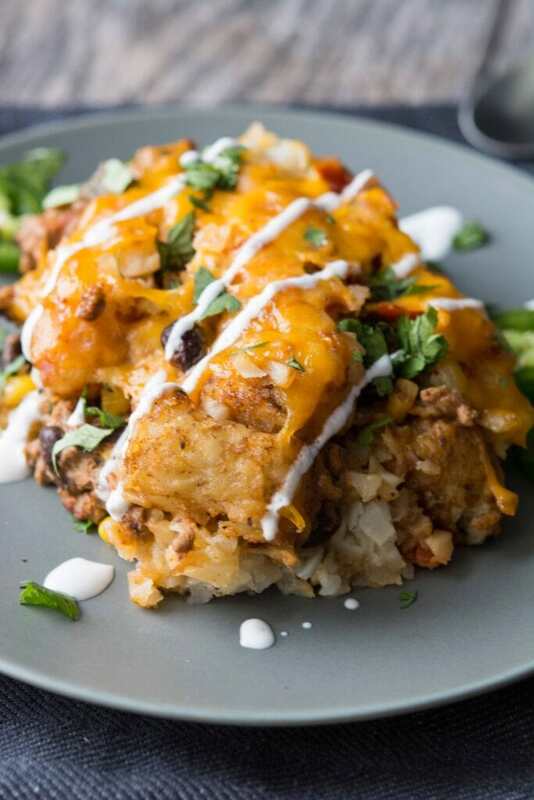 This recipe kind of comes together as a combo of those things my family loves and things I can get on the table quickly. 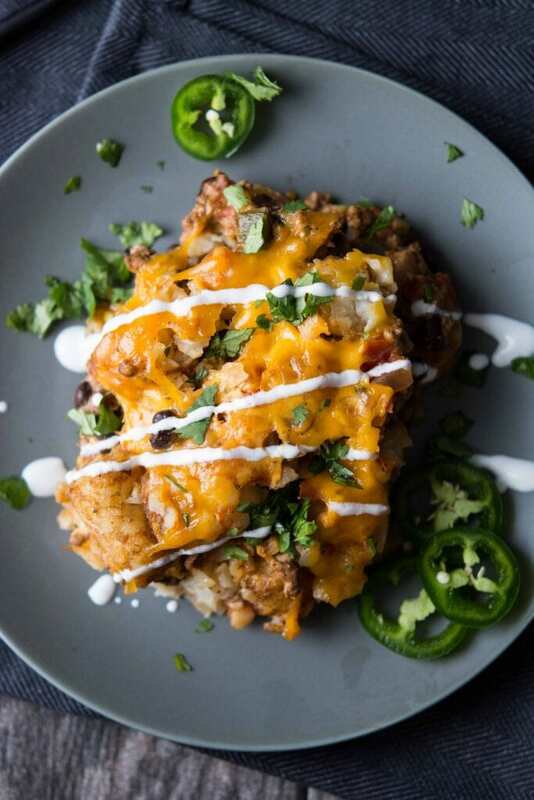 It’s essentially a taco meat style recipe doctored up with a few more ingredients and topped off with tater tots. And did you notice? No packages of taco seasoning!! This is cooked up with loads of tomatoes, salsa, corn, peppers, onions…. you get the picture. Lots of fresh taste and that is what will take your family taco night to a whole new level. What are your go to family meals? Will this soon be making an appearance in the rotation? 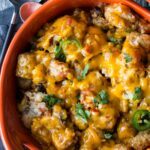 Tater tot casserole is a great dish to make up ahead of time and save time on a busy day!! 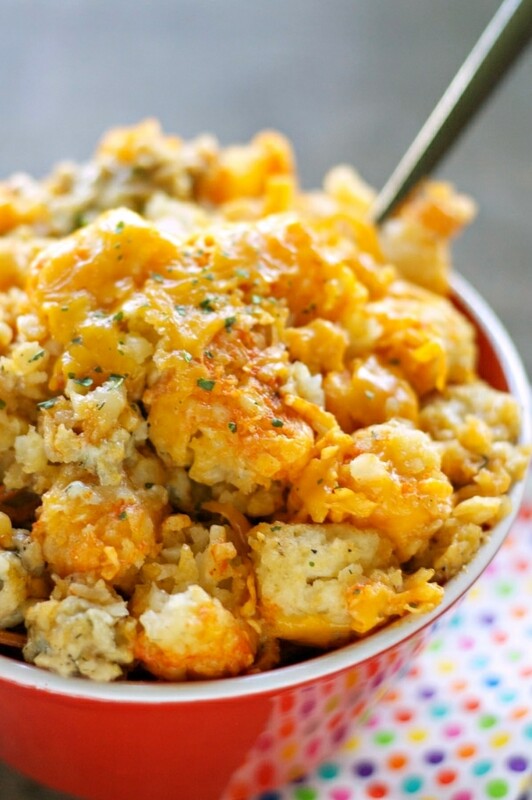 Want more tater tot casserole? 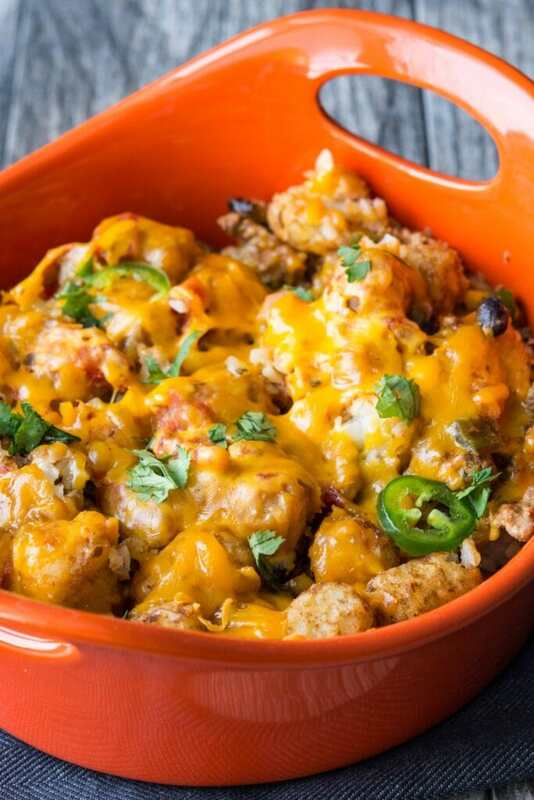 Try these tater tot casseroles in your slow cooker too!! 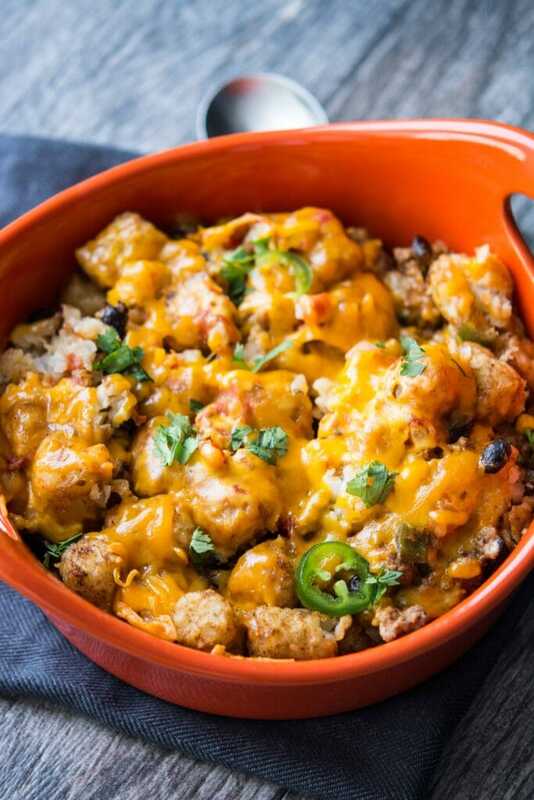 Hi Jennifer, This Slow Cooker Taco Tater Tot Casserole looks delicious and can’t wait to try. I do have a question. 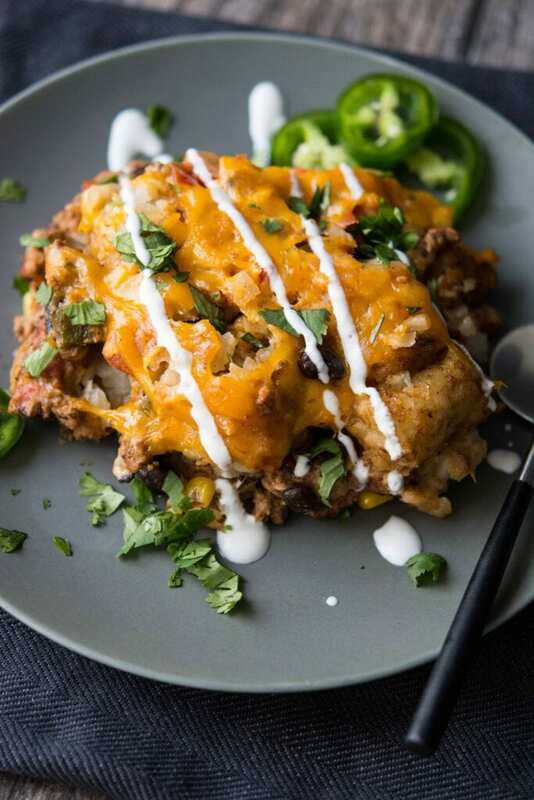 Can this be made in a regular (oval) slow cooker? And if so, do you do it the same as the casserole style slow cooker. Thanks for any help you can give me. 🙂 Have a wonderful and blessed day. Hi there, just curious on what kind of salsa do you use? 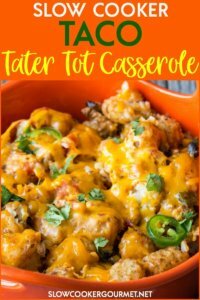 We love tater tot casserole, looking forward to trying this one. Thanks! I prefer a less chunky restaurant style that’s not too spicy. The Walmart brand is actually one of my favorites! Going to try this vegetarian style, using Trader Joe’s soy chorizo sausage. Good idea!! Let me know how it turns out! A lot of the recipes on here, including this one, call for ‘1 can’. I have no idea what that means in terms of the size of can or amount of that particular ingredient. Can you tell me or update the recipe to be a little more user friendly? Thanks.